At CES 2018 LG unveiled a new technology called Sound on Display that allowed its Crystal Sound OLED TVs to produce sound through vibrations of the display panels rather than traditional speakers... and it may be that the company will soon bring that to phones. 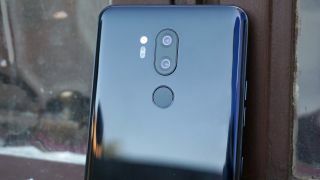 Sources have told reliable leaker OnLeaks that the technology will feature on the upcoming LG G8 flagship phone. There's no specifics on exactly how this could work on a smartphone, but it's likely to be similar to how the company has implemented it on some versions of its TVs. It may be that the phone has a main speaker inside the display itself, or just sitting behind it. This likely means we won't see a speaker grille on any of the edges of the LG G8, which may free up some more space for extra features or just provide a better design than previous LG handsets. The LG G7 ThinQ had a Boombox feature that made the entire phone into a sound chamber, so this feels like the next logical step for LG. The company has consistently focused on providing great audio on its smartphones, so we hope that continues with this new tech too. Some reports have also said Samsung is planning to unveil a similar Sound on Display technology for its phones at CES 2019, but it's uncertain whether that will be ready to debut on the Samsung Galaxy S10. Recently, we heard the LG G8 was set to launch in March 2019 with new 3D camera technology that's built for augmented reality experiences as well as general shooter improvements. The same report suggests the phone is unlikely to have 5G though.